Normal Spam Assassin -- HotDoodle comes with spam-assassin, the dominant and most common spam filter deployed on LINUX servers. Spam Assassin is an intelligent email filter that uses a diverse range of tests to identify unsolicited bulk email, more commonly known as spam. These tests are applied to email headers and content to classify email using advanced statistical methods. Spam Assassin is developed by Apache; the makers of the #1 web server software on the internet with almost complete market share control in the Linux website hosting market. Click on Spam Filtering to view the settings. Choose the level of spam filtration you want. The preset filters are great for basic spam protection. Email that is identified as span is filed into a "Junk Email" folder. HotDoodle will empty this folder from time to time if it fills up. Blacklists keep unwanted email addresses from sending mail to you. Whitelists do the opposite. They always allow mail from the addresses listed, regardless of spam rating. Rules, or addresses set in whitelists always work, before blacklists, so if an email address is listed in both the white and black list, it will still deliver the mail. In the “whitelist” section, simply type in an email address you want to bypass the mail filters and click Add to whitelist. You can also remove an address from the whitelist by checking the box next to the address and click Remove from whitelist. In the “blacklist” section, type in an email address you want to block and click Add to blacklist. You can also remove an address from the blacklist by checking the box next to the address and click Remove from blacklist. Do not bother trying to list ordinary spammers in blacklists, they change email addresses very frequently. Instead use blacklists for ordinary but confused organizations such as a school newsletter that will not let you unsubscribe. a. Browse to - Provides a link to the hosted email Control Panel to check email. 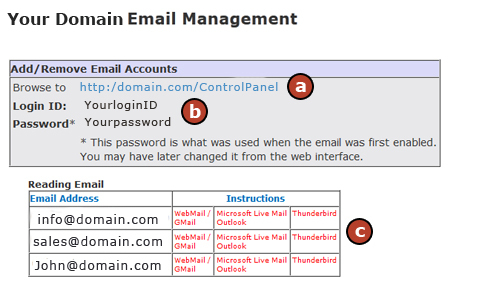 b. Login ID and Password - The login and password can be used to login to the email Control Panel. The login ID and password listed are what was initially determined when email was set up. If either was changed manually, the values on this screen will not update. c. Reading Email - Instructions and vital information necessary to forward hosted email to a third party email program. The programs listed in red are links to set up instructions for that specific program.